President Trump on Thursday issued an executive order aimed at streamlining Obama-era requirements for making federal buildings more energy efficient, though its differences with the approach of his predecessor appear modest. Like Obama’s March 2015 executive order setting goals for curbing greenhouse gas emissions, Trump’s order tasks certain agencies with leading the efforts to reduce energy consumption. But the Trump approach contains fewer mentions of “sustainability” and “greenhouse gas emissions” and stresses the potential savings for taxpayers by better managing the government’s 350,000 buildings, 600,000 vehicles, solid waste disposal and use of water. Trump directed the White House Council on Environmental Quality and the Office of Management and Budget “to streamline the broad and intricate range of energy and environmental requirements, and the complex directives on how to achieve them,” the White House said. The order consolidates requirements relating to energy and water use, high-performance buildings and renewable energy consumption. Each agency within 45 days will be required to appoint a chief sustainability officer, and each will track and report performance results to OMB for an annual scorecard. The CEQ will launch a single website to display progress. The GSA and the Defense secretary will perform a similar review of agency-owned vehicles. After 150 days, the CEQ and OMB are to issue new instructions for fleet management in compliance with the new order. 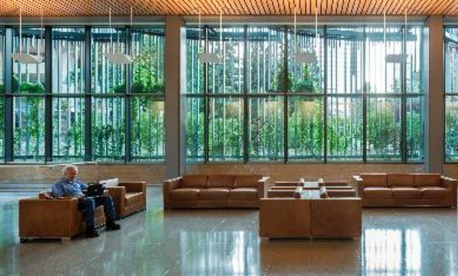 Efforts by the government—the nation’s largest energy consumer—to achieve “greener buildings” have had some success in recent years, according to the Government Accountability Office. This story was updated with a comment from GSA.